In the UK “The pirates ! In an adventure with scientists” an animated movie by Aardman Animations (the studio behind Wallace & Gromit) saw some success at the movie box office. The film was based by on the popular book by the same name by Gideon Defoe, which features, as the name suggests, pirates, Charles Darwin and scientists of the Royal Society. 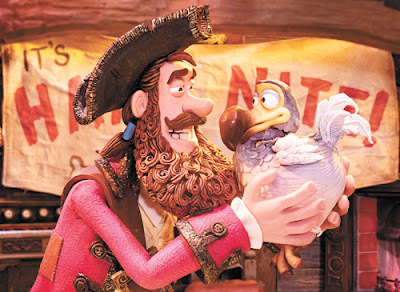 When the movie was screened in the US however, the title was changed to “The Pirates! Band of Misfits” because it was thought that American children would avoid a movie with scientists in. All reference to Darwin, who was one of the main characters, was also removed from US trailers, presumably because evolution is viewed as ‘controversial’ in the US. Why is it science is such seen this way in the US? Coming from the UK to live in US, I certainly noticed that science, especially biology, was not in the public eye as much as the UK. Science content of (non-tabloid) newspapers was higher in the UK and science documentaries were considered prime time viewing in the UK. In 2007, the average viewership of the first episodes of the David Attenborough documentary was 11.4 million viewers, or 18.9% of the UK populations . When the documentary aired in the US (with Sigourney Weaver instead of Attenborough) it received 5.72 million viewers or only 1.9% of the US population. To put that into context, 10.2% of the US population watched the American Idol finale in 2007, making a biology-oriented documentary proportionally almost twice as popular in the UK as American Idol. But it’s not just wildlife and the environment that attracts UK viewers. In 2011, the astronomy-oriented documentary Wonders of the Universe (2011), presented by Royal Society physicist Brian Cox, attracted 6 million viewers, or 9.5% of the UK population . Even historically, the US has been less enthusiastic about scientific achievements. To give just one example, Benjamin Franklin is known in the UK for being a member of the Royal Society. He won this accolade for his work on electricity, and his ideas revolutionized how electricity was perceived. He introduced the idea of positive and negative charge and the flow of electricity as a the result of a gradient or ‘pressure difference’ in charge, basically introducing the idea of potential difference, or voltage. Whereas in the US he is known firstly as a politician, and with regards to electricity, it is his work developing lightning rods that is known. This is just the tip of the iceberg with regards to his scientific feats, which include supporting the then hypothesis that light was a wave against much opposition, and charging the Gulf Stream with Matthew Maury and other fundamental oceanographic observations (both practical and purely scientific). How frequently do Americans discuss this side of Franklin? The civics test for new US immigrants has a question about Franklin and asks for one thing he is famous for, the “acceptable” answers include: writing “Poor Richard’s Almanac,” oldest member of the Constitutional Convention, first Postmaster General of the United States. Groundbreaking scientist is not included. Thomas Jefferson, as many know, had a huge interest in science, and especially advocating scientific education. So how have we gone from a such scientifically motivated and literate founding fathers to the state where science is almost a dirty word. In Congress today there are 535 voting members (435 members in the House of Representatives, 100 in the Senate). Of these, 22 representatives and 3 senators have some sort of medical degree, there is 1 engineer in the Senate and 5 in the House of Representatives, together with three scientists (a microbiologist and 2 physicists). So 34 US political leaders have some sort of scientific background of at least college-degree level, or just 6%. Thomas Jefferson said, “I can assure you, that the possession of [science] is what (next to an honest heart) will above all things render you dear to your friends, and give you fame and promotion in your own country.” Oh, if only this was the case as far as Congress was concerned. Past Committee members include the infamous Todd Akin, whose knowledge and understanding of female reproductive systems was based in the middle ages. The former chair of House Science Committee, (former) Rep. Bart Gordon (D-TN) said that “[the current committee] see science as a liberal plot, to validate something they don’t think is true. And climate change is a good example” (in Science 341(6141):15). When Rep. Smith first floated the idea of a “High Quality Research Act,” which would require any research receiving federal funds to go his committee, environmental scientists across the country had a collective shudder of fear at the idea that this science illiterate committee might make major decisions on research funding. On a local government level, the situation is arguably worse in some states. Education committees expunging climate change and evolution from textbooks aside, in 2012 North Carolina’s legislature passed a bill that prevented the measurement of sea-level, taking a toddler’s approach to climate change – if you don’t see the sea level rise, it is not happening. Famous science advocate Neil DeGrasse Tyson said, “The problem in society is not kids not knowing science. The problem is adults not knowing science. They outnumber kids 5 to 1, they wield power, they write legislation. When you have scientifically illiterate adults you have undermined the very fabric of what makes a nation wealthy and strong.” Sadly, this is all too true. Across the other side of the Atlantic, there have been complaints about a lack of scientists in Parliament (Goldstein 2010). But even so, there was public outcry recently when the UK government overruled scientific evidence and the advice of scientific advisors (such as Lord Professor John Krebs), to introduce badger culls (Brumfiel 2012) for example, and the deliberate ignoring/downplaying of studies such as Donnelly et al. (2006). The protests for scientific evidence-based policy were championed by many public celebrities, including Queen guitarist Brian May. Dr May has significant scientific credentials himself, having a PhD and published in Nature (Hicks et al. 1972) before going on to arguably greater fame via his guitar solo in Bohemian Rhapsody. Can you imagine such a state of affairs in the US? Isaac Asimov (1980) wrote, “There is a cult of ignorance in the United States, and there has always been. The strain of anti-intellectualism has been a constant thread winding its way through our political and cultural life, nurtured by the false notion that my ignorance is just as good as your knowledge.” Sadly, three decades later the situation has gotten worse rather than better, especially for environmental science. Asimov, I. (1980) A cult of ignorance. Newsweek (January 21): 19. Brumfiel, G. (2012). Badger battle erupts in England. Nature 490(7420): 317–318. Donnelly, C.A. et al. (2006) Positive and negative effects of widespread badger culling on tuberculosis in cattle. Nature 439(7078): 843-846. Goldstein, S. (2010). Parliament needs members who are scientifically literate. Nature 463: 876-877. Hicks, T.R., May, B.H. & Reay N.K. (1972). MgI emission in the night sky spectrum. Nature 240(5381): 401–402.